As Prince George turns one tomorrow, the media frenzy for all things George keeps churning, landing the young lad on magazine covers and in lists of the world's "most eligible toddlers," and giving the House of Windsor a PR boost no amount of advertising could possibly buy. A year ago, a media maelstrom swirled around a London hospital and the impending arrival of a baby third in line to the throne. Now, as Prince George of Cambridge is poised to turn one tomorrow, the media frenzy for all things George keeps churning, landing the young lad on magazine covers and in lists of the world's "most eligible toddlers," in the process giving the House of Windsor a public relations boost no amount of advertising could possibly buy. "Prince George has seen the Royal Family and the Cambridges' popularity soar," says Katie Nicholl, a London-based journalist and author. In an email, Nicholl says the monarchy is riding an "all-time high" largely because of the young prince and the "happy marriage" of his parents, Prince William and Kate, the Duchess of Cambridge. That popularity was also obvious Down Under when the young prince spawned headlines labelling him the "republican slayer" during the trip the new family made to Australia and New Zealand in April. "In Australia as recently as 1999 there was a referendum about whether Australia should continue to be a constitutional monarchy," says Carolyn Harris, a Toronto-based royal historian and blogger. "It seems that 15 years later, popular views of the monarchy are much more favourable, and Prince George is part of that process." The public scrutiny that ramped up after his arrival on July 22, 2013, has carried on despite — or perhaps as a result of — the carefully orchestrated public life William and Kate seem determined to create for their firstborn. "The Cambridges have made it clear that they expect privacy as a family, and the truth is we have only seen Prince George on a handful of occasions," says Nicholl, author of Kate: The Future Queen and the cover story featuring the young prince in the August issue of Vanity Fair magazine. After his birth, the next glimpse of Prince George came via family snapshots taken by Kate's father, Michael Middleton, in the Middletons' garden outside London. "As he gets older, we will likely see more of him, his first day at school and his first riding lesson etc., but [it] will be carefully controlled by the palace PR machine." As much as George has helped boost the Royal Family's public image, his arrival has also helped rearrange its personal dynamic. "It's interesting how it's affected how all the various members of the Royal Family are viewed," says Harris, noting the perception of George's 88-year-old great-grandmother Queen Elizabeth has been cemented as an elder stateswoman. "She's in a similar position as Queen Victoria in the last years of her reign, being the matriarch of a large Royal Family followed by three generations of direct heirs to the throne." Coverage of William's father, Prince Charles, now tilts at his role as a grandfather, something he also mentions in speeches. "He talks about wanting to safeguard the environment for future generations so his grandson can appreciate these things," says Harris. 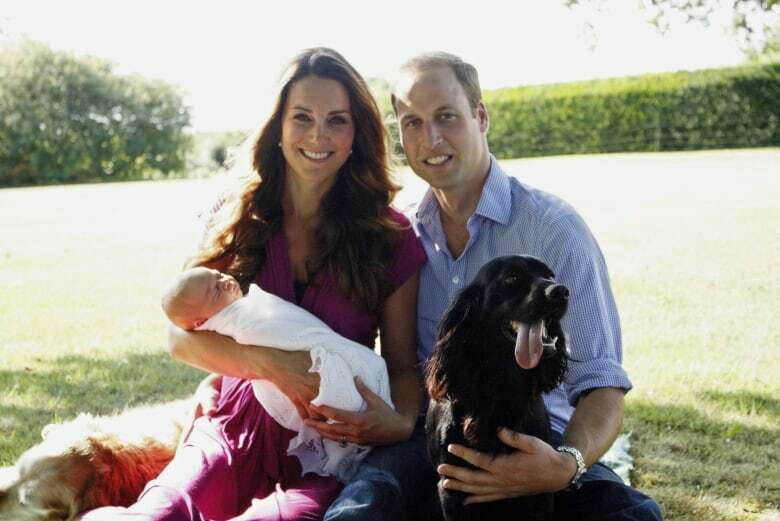 William and Kate have also come under intense public scrutiny for the decisions they have made as parents, something that was obvious from the day after George's birth when questions arose about whether William had flubbed it with the new family's car seat as they left the hospital. Royal members somewhat more distant from George have also had their actions scrutinized through the lens focusing on him. When Princess Anne, William's aunt, was in Canada last October, U.K. media reports were noting she was out of the country at the time of George's christening, although her schedule would have been set long before the date for the christening was known. "Even Princess Anne's overseas tours are being viewed in relation to what was happening in Prince George's life at that time," Harris observes. For all the attention that has been paid to George, the actual glimpses of him have been few and far between. 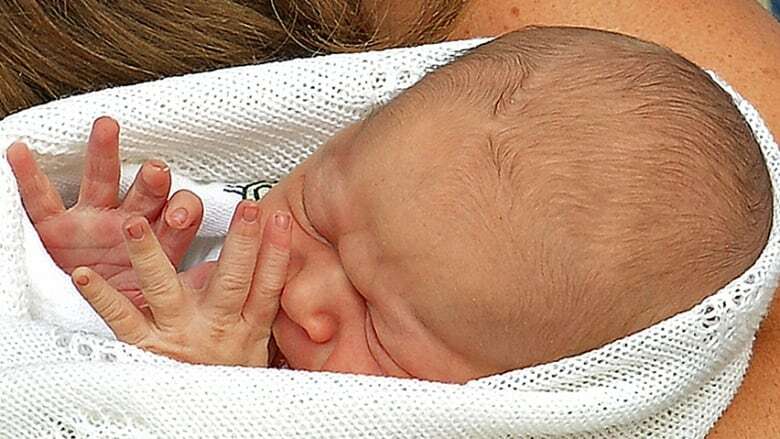 After his birth, he was next seen at the christening three months later, although there were a couple of family snapshots released in August and a couple of other photos — one paparazzi, one official — in subsequent months. The next time he appeared in public, he was nearly nine months old and coming down the airplane steps in the arms of his mother when the family landed in New Zealand. Nicholl says that trip was a "milestone moment" for the young prince who was the well-behaved "star of the show." "Prince George proved to be a cover star — just like his mum. His cute and classic outfits were copied all over the world and the 'George effect' was born." For all the fuss around George's arrival, his actual birthday is likely to be much more modest. Three new official photos will be released — one of him walking came on the weekend and two more are expected tomorrow — but Nicholl says there won't be a big party to celebrate. "William and Kate are low-key so expect a small tea party for family — the Middletons [Kate's family] will of course be invited — and the couple's closest friends." The birthday will also be markedly different from William's first, which occurred in June 1983 while he was at home in the U.K. and his parents, Charles and Diana, the late princess of Wales, were visiting Canada. "Charles and Diana were absolutely showered with gifts to take home for William," says Harris, noting those presents included a miniature canoe that Charles joked could be a toy for William to play with in the bath and a miniature deerskin suit from the Mi'kmaq First Nation. Three decades ago, even though Charles and Diana were more involved in William's upbringing than previous royal generations, the official schedule still seemed to take more precedence over family priorities than is the case with George. But other factors could play into that. "The fact that William is second in line to the throne gives him more freedom than Prince Charles had when his children were young," says Harris. However George celebrates his birthday, he may have a new slide to play on. Jupiduu, a German company, couldn't resist putting out a news release earlier this month noting that one of its children's slides appears to be destined for George's residence at Kensington Palace in London. “We are delighted to honour this order. We are sure that George will have lots of fun with his blue slide, the Blue Whale, and of course we will go out of our way with the royal gift wrapping," Jupiduu founder Ken Buschmann said in a news release. 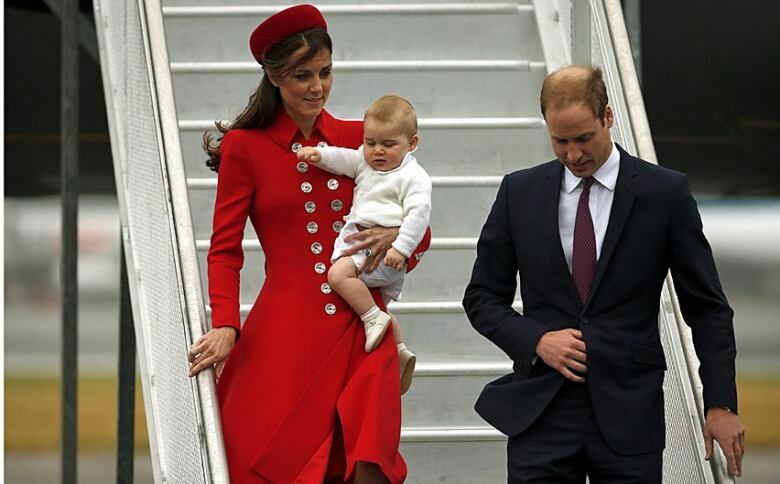 Baby Prince George off on first royal tour to Australia, N.Z. 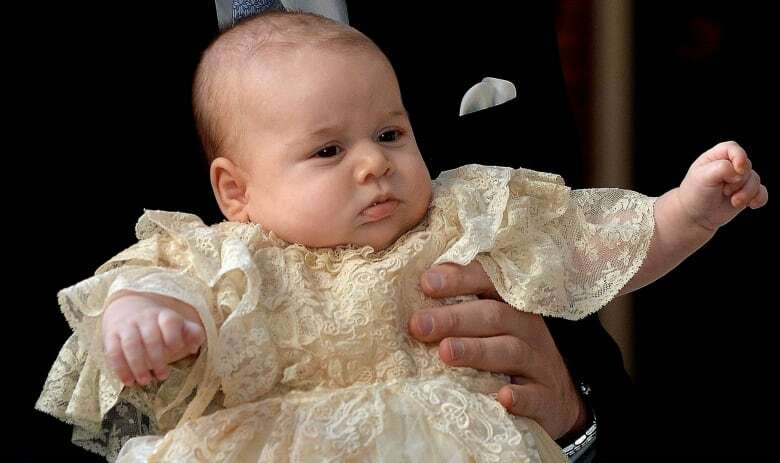 Will baby Prince George ever become king of Canada?